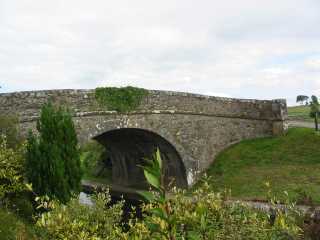 The Royal Canal stretches 90m miles / 146 km from the river Liffey in Dublin to the river Shannon at Clondra, County Longford. Work commenced on this engineering feat in 1790 and finished 27 years later in 1817. 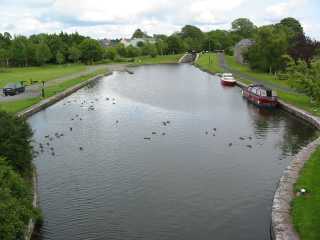 The canal passes through Maynooth, Enfield and Mullingar, with an additional spur connecting Longford. By the 1830's the canal reportedly carried 40,000 passengers on average as well as 80,000 tons of goods. During the following century, with the advancement or the road network, the canal fell into disuse. The Canal was officially closed in 1961 and fell into disrepair. Restoration work has been undertaken in stages and the Royal Canal is now navigable from Dublin to Abbeyshrule, Co. Longford. Boating, angling and canoe polo are the main activities on the waterway while many walkers follow the Royal Canal Way or explore the towns along the banks. Over the years since the commencement of restoration many private boats have enjoyed the peaceful waters of the Royal Canal as they travel along the open section. 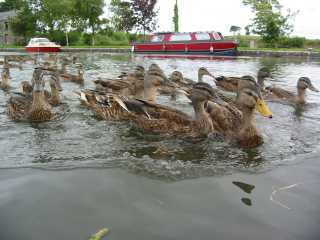 While the canal was closed the Royal Canal Amenity Group worked tirelessly for its restoration; many of them now own boats on the canal. The opportunity to explore this saved treasure on holiday is also available to those who wish to hire boats or walk along the towpaths. As with all of Ireland's waterways the canal passes through some of Europe's most beautiful countryside and, whether you are on a boat, or simply on foot, you'll have ample opportunity to enjoy it all. The towpath that has been so lovingly cleared has now been designated The Royal Canal Way (a National Way Marked Way). It stretches the 121km to Abbeyshrule and will reach towards Longford and the Shannon Navigation as the canal is restored. Angling is another popular activity, with roach proving to be one of the most popular fish, along with pike, tench and bream. Canal bream rarely exceed 4lbs, but pike can offer a real challenge, weighing in at 20lbs, and anglers of all levels of experience will find excellent conditions along the Royal Canal.